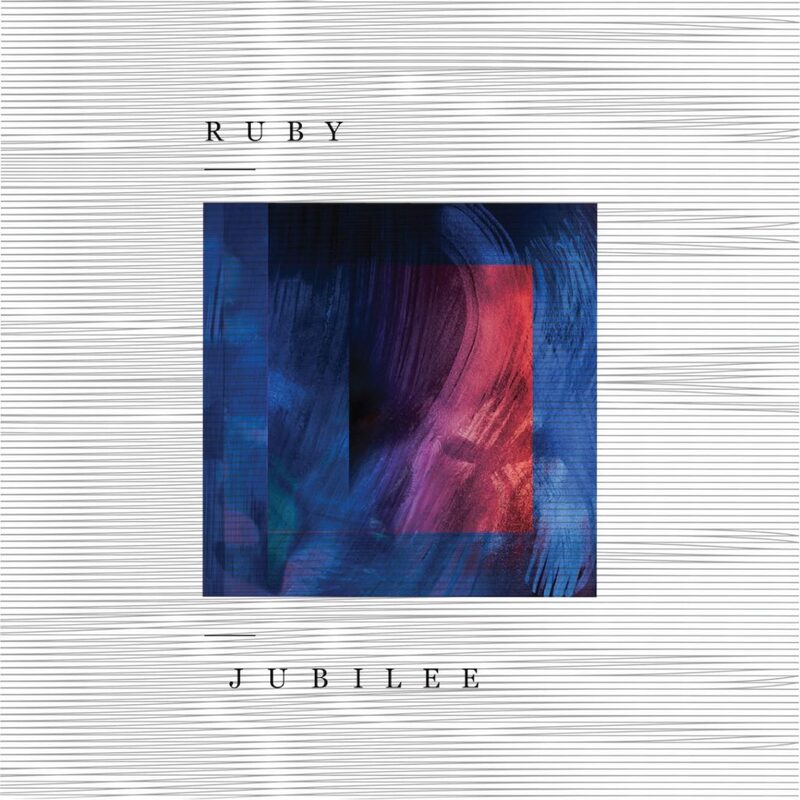 I’ve never listened to anything like Ruby Jubilee’s self-titled debut collaboration. The joint project from composer Tareq Abuissa and producer S.H2O is intricately composed, lushly produced, and so intentional about each artistic choice. Sitting somewhere between hallucinogenic musical and diary dreamscape, it’s truly difficult to choose a genre to describe it. Fleshing out the project are musicians Phil McNeal on drums, Jacob Sunshine on electric guitar, Diana Flanagan on vocals, Maximillion Zooi on bass clarinet, Corey Dansereau on trumpet, and Andy Clausen on trombone. 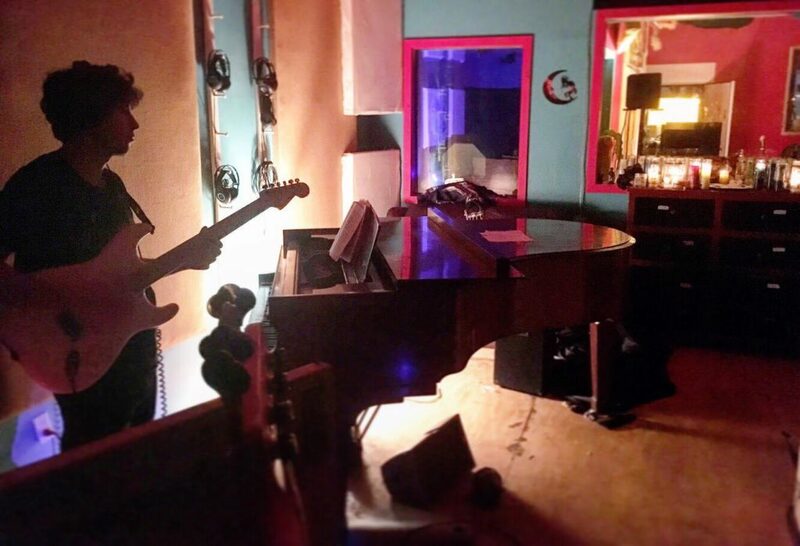 The album was recorded by Oliver Ignatius at Holy Fang Studios in Brooklyn, NY. 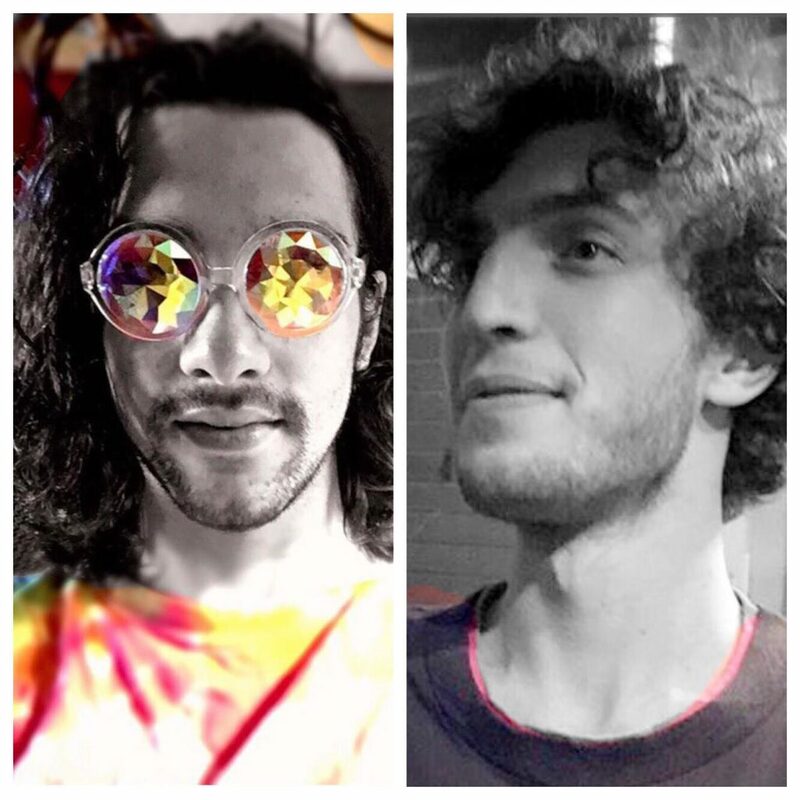 I knew I had to break the writing dry spell with a conversation about this album, so I recently caught up with Tareq and Spencer (S.H2O) about the songwriting and production process for the album. The duo live and work in Crown Heights, Brooklyn, and I video chatted them from San Francisco. The following is an edited and condensed version of that conversation. Interview after the jump! SHF: Tell me about how you two met and got your start. Tareq: Spencer and I met as undergraduates at Columbia, studying music theory together. We collaborate now on this project. Currently we’re sharing music and lyrical responsibilities. For the first album, I primarily started a demo album of ten tracks, then Spencer joined on and helped flesh them out and arrange them. 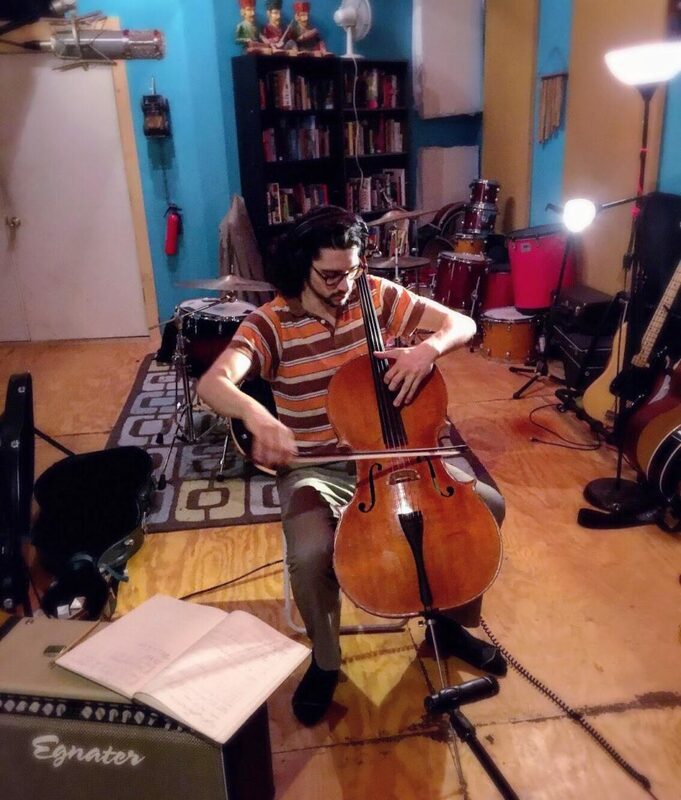 Spencer: Tareq had asked me about recording studio recommendations in Brooklyn, so I recommended the spot now called Holy Fang Studios, which used to be called Mama Coco’s Funky Kitchen. Tareq had a good time during his first session there, and I listened to the demos he made and decided it was a project I wanted to be a part of. T: Spencer’s the first person I reached out to to share my music with. I had been a fan of his band Sun Looks Down, with many of the same performers on that album, that already released music before we graduated from college. S: I still play with those same musicians on a separate band called Pear Moth. SHF: How do you try to strike an instrumental vs. lyrical balance with your music? I love the lush compositional nature. T: This project started with music. Lyrics began fermenting after listening back on those instrumentals, and we definitely cut out some sections of lyrics, because it became oversharing. We felt it would be better to just allow the instruments to deliver the emotion of the songs. That was all part of this arrangement and collaboration process after the demos. S: Tareq and I would bounce Ableton demos of the tracks back and forth, and I did a lot of stripping down of those. SHF: Can you tell me more about the songwriting process? T: I’d typically start with one verse and one chorus, then Spencer joined on and we’d increase the lengths, and question which layers should be in the songs and change those up. That was the process of making our collaborative demo album. 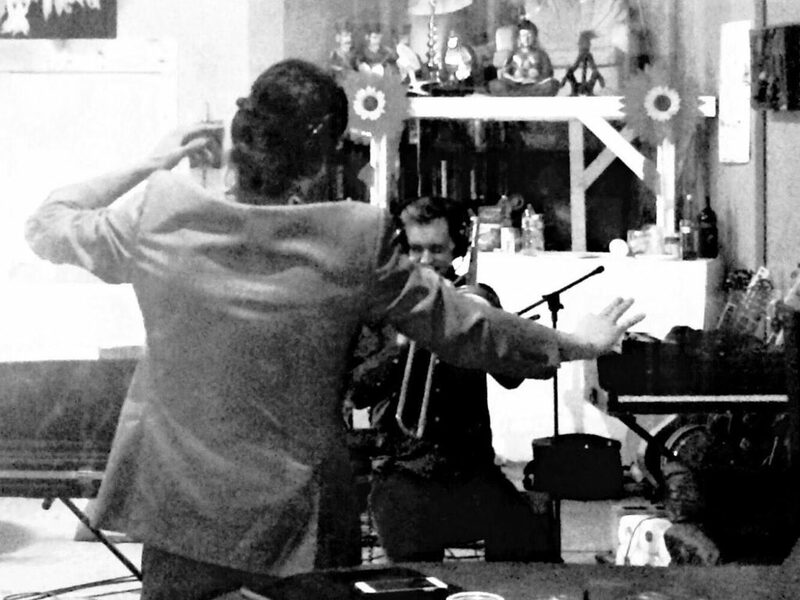 Once we felt confident that the structure of the song was in place, we’d go into the studio, having 4, 8, or 12-hour sessions with ourselves and other musicians to, track by track, replace certain melodies with live performances. Including drums — they were just MIDI drums at first, and then Phil did something. In the case of “Black and Blue”, he really took the track from almost nothing and put down the foundation with some ideas we had spoken about. SHF: How did this project become such a hallucinogenic landscape? Was that intentional? S: The demos were super weird, and we sort of just kept going. I think this album is definitely not a concept album. Each song exists in its own world. T: We were conscious of recording a lot of acoustic elements, and having some electronic elements that were kind of smooth and subtle in the background to tie it all together. The Beach Boys were a big influence. A lot of the rock we like is more psychedelic-leaning, and that’s what I like getting out of music a lot of the time. SHF: There’s so much complexity to the foundation of your sound and instrumentation. Can you talk about that? T: In “We 3 Dolphins” there are 12 cello tracks [laughs]. S: I play with the guitarist and drummer from this album all the time, but the bass clarinet player [Maximillion Zooi] I knew from when he lived in LA. He was incredible, and made some really creative tracks. T: That’s definitely a sound I was looking for, and it became such an essential layer. SHF: Do the themes across songs connect? S: Each song is in its own world, but we were trying to have a cohesive song texture. I think that was accomplished by having the same musicians throughout. T: A key theme I’d emphasize is being delusional, due to attachment or having a crush on someone. The lyrics are all angles on that: “Snowing in the Spring” expresses the sadness in disillusionment, in slowly accepting that you’re not reciprocated in your love. “Or Not” is sarcastic to the point of being abrasive and condescending. SHF: What’s the message there? Also, Diana Flanagan’s singing is so incredible. T: I think the narrator is taunting someone who’s trying hard but not really succeeding. S: I definitely wanted that song to take a overall sarcastic tone, while leaving the lyrics ambiguous. T: Spencer helped tone down the performance a little. S: That song is almost trying to conform to a genre, to its detriment. T: Yeah, like maybe Pink Floyd progressive rock. SHF: On the closing track “Broken Too”, it seems like the other is finally being addressed. Who is the “you” in this context? T: There were definitely two levels I wanted to address. One is a lover, but the other is really God. SHF: What are you guys working on next? S: I don’t think we’ll ever make an album that sounds like this one again, which makes this project an interesting starting point. Our upcoming project has a soul influence. We’re looking forward to starting together, rather than having two disparate forces coming together to makes something. T: We’ve been listening to a lot of soul, and hoping to make this more bass- and beat-driven. S: The type of music we’re making right now is really fun to make. We had fun making this album, but a lot of it was a lot of work. T: We’re thinking more about live collaboration. We’re trying to attract an audience that’s more interested in listening to pop music. S: I don’t want to say pop because that’s really specific, but more snare on 2 and 4. SHF: Could you elaborate on easier? S: I definitely love to layer 20 cellos. Easier wasn’t the right word. Just more of a blast to make. SHF: Is there any live version of the current album in the works? S: Definitely not for this album, but that’ll be interesting for the new project. T: The first album was really born in the studio. SHF: What were some of the production influences on this album? S: I’m hugely into funk and soul, hip hop and R&B. That’s definitely an influence for me. Marvin Gaye’s album I Want You was hugely influential on me. A lot of the vocal harmonies, and the layers, especially on the title track “I Want You” were really influential in how we approached the vocals in the album. The “Perfume Dream” choruses are inspired by that album. T: The Beach Boys were a big influence on the way we approached recording. And the counterpoint from classical instruments coming in. S: The album Surf’s Up is also a huge influence. T: That’s where it gets more psychedelic. S: That vocal delay effect on “We 3 Dolphins”, the reverse delay type thing, was completely ripped from some song on Surf’s Up. T: Yeah, from “Feel Flows.” When I listen to that song, it’s so anticipating Animal Collective. SHF: What kinds of techniques were you trying to use? T: Blending tracks is a big part of the sound. Like where the vocal blends into the background, and it’s hard to know where it ends. Flanger and phaser give some familiar crunch to things. S: My favorite one thing that we did was on “Swan Song.” The acoustic guitar is literally like 9 guitar parts panned around in the chorus. T: Like a flock of birds coming up, was the sentiment. Restraint was a big part of my learning process from recording this album, and giving space. Just knowing that no matter what you do in one performance, there’ll be others that it needs to share space with. S: “Perfume Dream” is probably my low-key favorite track on this album. I really like that song a lot. I felt more of a connection with this track than with the other ones. We wanted it to tell a story and make it as good as possible. T: And the production really does reflect a dream, with these airy harmonicas floating slowly overhead. Awakening from that dream in the abrupt ending is kind of funny. SHF: Are there any other musical projects you two are involved with right now? S: My band Pear Moth, from which the guitarist and drummer were featured on this album, will be releasing a single this summer. And we have an EP we released in December that’s on SoundCloud (link). SHF: Any themes you’re re-visiting in the new album? T: We’re definitely going for something a little more positive, and fun and danceable. Colorful. SHF: What have you been listening to recently? S: Dirty Computer by Janelle Monae is incredible. Especially the first track is transcendent. It has Brian Wilson [from the Beach Boys] on it. That one’s been stuck in my head. Also the engineer we recorded with at Holy Fang Studio, Oliver Ignatius, just put out a single for his solo project, “City’s a Hell” that’s really great. Also the new Robert Glasper Experiment album, ArtScience. There’s also Chris Dave and the Drumhedz (self-titled album). He was one of the drummers on Black Messiah; that’s probably his most mainstream project. T: Thundercat’s Drunk is great, I’ve been into that. S: Oh yeah, this isn’t super new, but I’ve also been low-key obsessed with Anna Wise’s album The Feminine: Act II. It’s really something. SHF: Thank you both so much! This entry was posted in Interviews, Reviews. Bookmark the permalink. Thank you for the thoughtful interview and writeup, Pavel! Our hearts were warmed by how you appreciated and felt the music. SHF is a music blog bringing you in all genres, but especially world, rap, alt rock, electronica, and classical.